Have your prioirites changed or stayed the same? Help us plan for the future by giving us your opinion. Majority of responses would like to see the Council spend money on renewing the lake edges and Island. Several comments received regarding transport facilities and road / traffic concerns. Other comments include renewable initiatives, stricter control over dog fouling, cutting down of trees and the appearance of some of the village. 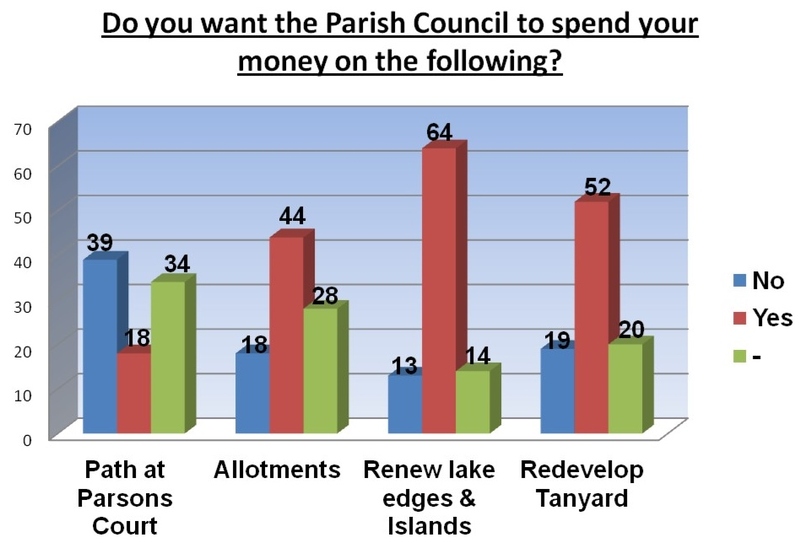 What would you like to see the Parish council spend your money on? Do you want the Council to spend your money on a path at Parsons Court leading to the park? 20% of those who responded to this question stated ‘yes’ and 42% answered ‘no’. The path from Parsons Court should have been laid when the houses were originally built at a cost to the housing association or construction firm. This should not now be paid for by the Parish. A footpath from Parsons Court is essential – I have noticed cars are now parking on the left hand side of Southdown Road opposite Parsons Court which is very dangerous – perhaps this could be addressed. Do you want the Council to spend your money on Allotments? 46% of those who responded to this question said ‘yes’ whilst 20% responded by ticking ‘no’. Do you want the Council to spend your money renewing the lake edges and Island? Nearly 70% responded ‘yes’ to this question whilst 14% replied ‘no’. Nothing is wrong with lake. The lake is in the centre of the village and more should be made of it. I believe restoring the island would encourage ducks and other birds away from roads surrounding the lake. There is a safety issue here for both the wildlife and road users. Please look after our wildlife and renew and maintain the lake with carewe have kingfishers (a schedule 1 bird) and other birds that need our protection. No more trees to be planted near the lake footpath – damage already caused to the footpath. Do you want the Council to spend your money redeveloping the Tanyard? Develop Tanyard but not over the top fancy – let’s not lose its character. Don’t waste money on the Tanyard, it is destroying the village shops that are struggling to survive. Put pavement inside Tanyard and widen road by Devon & Cornwall Public House. Tanyard should not be reduced for parking cars. What would you most like to see the Parish Council support? Do you want the Council to support Affordable housing? New trunk road is essential before anymore building is planned in the Rame Peninsula. No more development until road access is improved. Stop further housing developments – we want to live in a village not a town! There are a number of affordable houses for sale in the village and they are not selling! Definitely no more social housing, we have more than our fair share in Millbrook. Above all no more expansion to the village whether it be housing, expansion of jobs etc without new road to access the village. Housing can’t be supported now because of roads – too much congestion as it is.In small numbers – infill only. Not Parsons Court phase II – too many / too soon.No more building of houses in village – infrastructure can’t cope. Traffic and parking is horrendous.No further housing until infrastructure is improved. Village cannot cope with new housing projects due to congested, limited access via Hounster Hill. Roads cannot sustain anymore development – soon there will be more cars than people. Heavy lorries are ruining the front of houses. Do you want the Council to support Improved safety features? Get rid of existing priority signs, replace with oncoming vehicles in middle of the road signs. Widen road along lake to Southdown. Laybys needed on New Road and sleeping policemen across road to slow down traffic. 10mph (pedestrian priority) in West Street. Change priority entrance to West Meadow (Mini Roundabout) to slow traffic. Urgent attention for traffic calming in St Johns Road due to volume and speed of vehicles using it. Double yellow lines on the corner end of Trefusis Terrace. Pedestrian crossing near St Johns Close for children going to and from school. Road safety features should be traffic lights to turn red if people are speeding. Improved safety features with no speed bumps. I think the traffic in Hounster Hill is nonsense & more likely to cause rather than prevent an accident. We have enough speed bumps! I feel there will soon be a fatal accident without improved road safety features, including speed humps and a 20mph limit especially from and including Millpool Road and South Down Road. Letter received dated 26/10/11 from a resident referring to concerns on road leading out of Millbrook on B3247 towards Kingsand/Cremyll being narrow and dangerous and unlit section of road from Heart and Hand Public House to bottom of Hounster Drive should be provided with lighting without delay. Do you want the Council to support local employment opportunities? 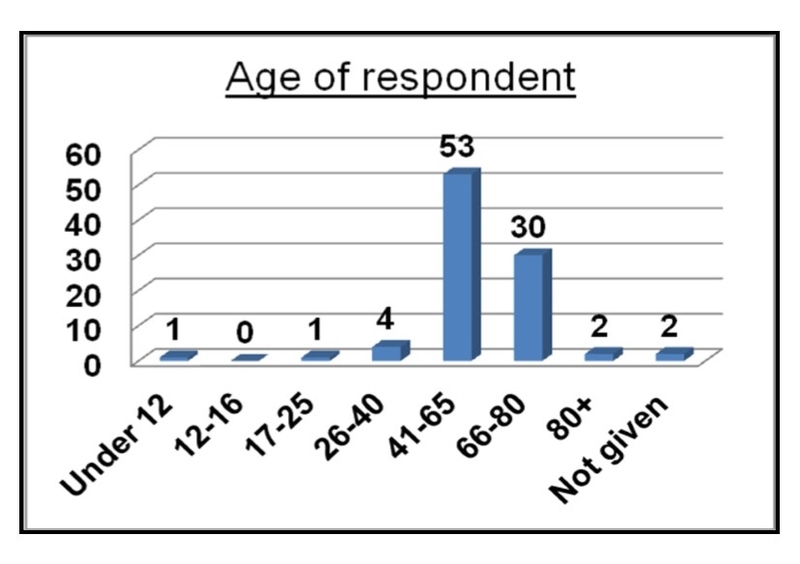 68% responded ‘yes’ – One comment received – Yes, local employment opportunities IF for local people. 9% responded ‘no’ to this question. Do you want the Council to support integrated transport facilities with the ferry and hospitals? Public transport in general, people without cards are in danger of being isolated in April when the bus routes are being slashed. My biggest priority would be the loss of 81C – especially late evenigs and after last ferry (Cremyll). Transport to ferries and hospitals. Better bus transport out of the village at weekends. Integrated facilities with ferry an transport. Hourly bus service to Torpoint & Plymouth via ferry. Keep fighting public transport. What is the point in encouraging people to use public transport if they are planning to reduce buses. Transport! Parish Council to voice concern to CC about proposed cuts to local transport. Not everyone has a car – rumour is bus link will only go as far as HMS Raleigh. With HMS Raleigh & other establishments should we be making provision for people to work? I have been told First Bus is pulling out due to Council cuts; therefore people who need to work won’t be able to get there. I want the Council to join the fight to stop the cuts to the Rame Peninsula Bus Service. Would like sensible bus service that goes along Anderton Road both ways all days. A triangular service round Rame to Torpoint – not long distance double deckers. Go back to the system that worked in the 1970s and 1980s. Do you want the Council to support a 20mph speed limit? Letter from resident suggests traffic flow restriction with priority notices plus speed bumps and 20mph speed limit should be put in place in section of road from Heart and Hand Public House to bottom of Hounster Hill. Of road parking should be available on the lake instead of waste land. Renewable initiatives. Affordable housing for people who already live in Millbrook in expensive rented accommodation – flats for single people. Improved parking for doctors surgery and pharmacy. Dog Fouling – signs warning of possible fine of £1000. Dog owners to put leads on dogs around lake. Cut back trees around the lake, playing field, New Road and Southdown Road. Tree routes on footpath on New Road need attending – husband has tripped on them several times. Remove ugly and unsightly granite blocks from Lime Kiln Landing and by the Pharmacy. They serve no purpose, cars never parked there. They ruin the natural look of the village and make it look like a dereict building site. Better control over dog fouling. Illegal activity (squatting) in Foss Quarry and Boat Yard. Dog fouling should be enforced! Car parking – use the old football field and get the cars of the road in Millbrook. No trees planted close to the path from village to Anderton. Repaired sections are already showing signs of tree roots coming through. Sustainability issues – energy, transport, local food, employment opportunities. Anderton Road water front needs repairs. Tree root are pushing up the tarmac on New Road footpath. Whilst off work I was sent to Torpoint Doctors because I could not get to Cawsand if the proposed planning is given to new Health Surgery in Torpoint I believe Millbrook and Cawsand Doctors Surgery will close and everyone will have to go to Torpoint. Millbrook Village is a disgrace – weeds in curbs and road falling away, infill buildings that shuts off the public rights of way in Newport Street and New Road. I would like the Council to cut back trees along Southdown Road, New Road, Children’s play park and Anderton Road. My husband rides a push bike and to avoid oncoming traffic had to ride close to the trees and had his glasses knocked off. Two lights in New Road need new P/E cells. Renewable Energy Projects would be a good investment for the Parish Council to bring income to the village. The amount of traffic that passes past my house is becoming worse. Is there any way some can be redirected along the coast road? The lorries seem to be getting bigger and if one walks along the narrow part of the road (begining of West Street) one takes ones life in ones hands! A film festival in Millbrook. We are a dirty village in parts. (i) Disgraceful state of Council and privately owned garages in Newport Street, ie black and green mildew on walls, years old dirt and weeds all around. Would users neglect them if built onto their homes?! (ii) Pile up of stones above permitted levels are “untidy sites” that “adversly affect the amenity of the area”, ref section 215 Notice that Local Planning Authority may serve requiring it to be tidied up. (iii) Street drains are unswept and clogged. Water to level of doorstep in one case. Saving electricity and reducing light pollution. How about a Youth Centre that is open house every evening or at least 5 evenings for local people manned by volunteers. I will volunteer too. It will be a home from home and have real skills sessions which are useful and cathartic to the individual (eg journalism, documentary making, music recording and writing and communication skills). My priority is sensible bus services that go along Lower Anderton Road both ways all day. Triangular Service round Rame to Torpoint – not long distance double deckers – go back to the system that worked in the 1970s and 1980s. All my priorities (exception of renewing of the lake edges & Island) and my priority is I would like a hydro electrical generator to be built at Insworke Saltings on St Johns Lake. It could proMduce electric for the local community. Millbrook is heavily used by yachts so wouldn’t be a good location. The top lake is only occasionally drained so putting one on the dam wouldn’t be cost effective. The Saltings wall already exists.A hydro electric generator wouldn’t affect the natural habitat environment. The tide rushes in and out of the Saltings twice a day. We could become a figure head local community promoting sustainability. We are called “Mill”brook after all. have also suggested the £4K that would be given to Millbrook by the REG Windpower generator scheme is put towards a feasibility study into an electrical power plant at Insworke.